Happy fall from the Coal River Valley! Here’s a quick update on what we’ve been up to, and some of what we’re doing next. Since August, RAMPS members and friends have been supporting the native water protectors at Standing Rock in their fight to protect water and sacred lands from the proposed Dakota Access Pipeline. 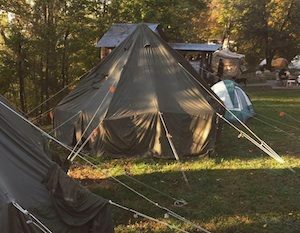 We’ve mostly been involved at Red Warrior Camp, created to facilitate direct action against the pipeline. It’s an intense fight, and represents a crucial moment for the broader struggles for climate justice and indigenous sovereignty, and a test of movement strength and solidarity. We’re about to send another crew with a truck full of construction tools, a big army tent, medical supplies, and — if we can afford it! — a big generator. You can read more at our fundraiser page. We’ve already raised more than half of our goal! Can you make a donation today, so we can help water protectors dig in for the winter and defeat the pipeline? In September we were glad to partner with Herbal Medics and Aurora Lights to host a three-day drop-in herbal health clinic at the Salamy Community Center just down the street in Whitesville. Dozens of people came through for consultations and advice and free herbal medicines. While they were here, Herbal Medics’ engineering team also worked with us to construct 2 rainwater collection and filtration systems, at the Prenter UMWA Hall and Stanley Heirs Park. We held another great weekend up on Kayford Mountain, hosting about 75 friends, neighbors, students, and other visitors for meals, music, storytelling, tours, and workshops. Thanks to everyone who made it a success, especially our terrific presenters and supporters from across the region. Special shout out to the Ohio Valley Environmental Coalition, the Stanley Heirs, and our friends at Seeds of Peace East for feeding everyone so well all weekend! Are you and your neighbors fighting off a pipeline? Are you in a student activist group that’s trying to figure out what to do beyond campaigning for divestment? 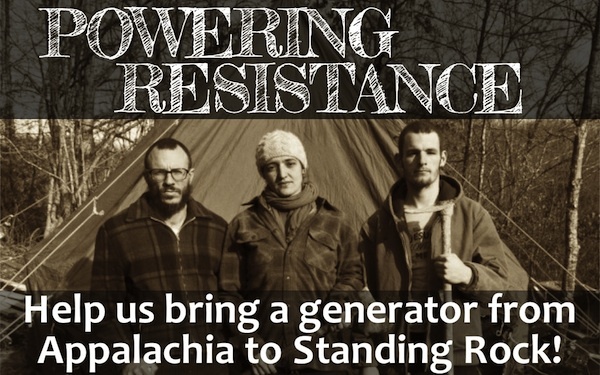 In November and December, building on our recent success in the Kanawha Forest Coalition’s campaign to close down the KD#2 mountaintop-removal mine, we’ll be doing some traveling around the broader region to talk about direct action, campaign strategy, and supporting & aligning with broader movements for liberation. If you want to bring us to your town to share ideas, compare notes, and scheme strategies together, get in touch! Thanks for reading. Be safe, keep in touch, and come visit! This entry was posted on Wednesday, November 2nd, 2016 at 1:46 pm	and is filed under Fall Summit, Kanawha Forest Coalition, Solidarity, Tar Sands. You can follow any responses to this entry through the RSS 2.0 feed. You can skip to the end and leave a response. Pinging is currently not allowed.